1608 quarto of King Lear. First official record: entered into the Stationers' Register by Nathaniel Butter and John Busby on 26 November 1607 as "A booke called. Mr William Shakespeare his historye of Kinge Lear." 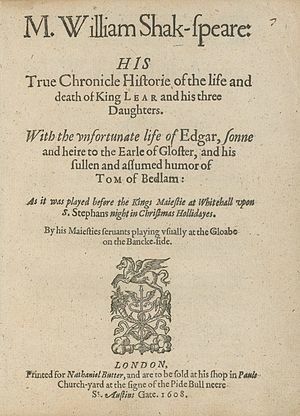 First published: version of the play published in quarto in 1608 as M. William Shakspeare: His True Chronicle Historie of the life and death of King Lear and his three Daughters. With the unfortunate life of Edgar, sonne and heire to the Earle of Gloster, and his sullen and assumed humor of Tom of Bedlam (printed by Nicholas Okes for Nathaniel Butter). This text was republished in 1619, as part of William Jaggard's "False Folio" (printed by Thomas Pavier). The 1623 Folio text appears under the title The Tragedie of King Lear. Additional information (publication): although the 1608 quarto text is not usually considered a bad quarto per se, it does differ substantially from the Folio text; Q1 contains 285 lines not in F1, and F1 contains about 115 lines not in Q1. Additionally, over one thousand individual words are different between the two texts, each text has completely different punctuation, much of the verse in F1 is printed as prose in Q1, several speeches are given to different characters (including the final speech of the play – Albany in Q1, Edgar in F1) and each text features different scene divisions.The New Cambridge Shakespeare has published scholarly editions of both texts; F1 in 1992, and Q1 in 1994 as part of their Early Quartos series, both versions edited by Jay L. Halio. The 1999 Pelican Shakespeare edition of the play, edited by Stephen Orgel included both Q1 and F1, as well as the conflated text originally created by Alexander Pope in 1725. Similarly, the Oxford Shakespeare: Complete Works also included both versions of the play in their second edition of 2005, each edited by Gary Taylor. The Q1 text appears under the title The History of King Lear, and is dated 1605–1606. The Folio text appears under the title The Tragedy of King Lear and is dated 1610. Taylor believes Q1 represents an early draft of the play, written prior to performance, and F1 represents a revision written four or five years later, after numerous performances. He feels the differences in the two texts represent a "more theatrical" version of the play, which streamlines the plot and improves the characterisation of Edgar, at the expense of Kent and Albany. Although Halio disagrees with Taylor's assessment of F1 as "more theatrical," he reaches the same conclusion regarding the provenance of the text; Q1 was probably set from Shakespeare's foul papers, whilst F1 represents a performance text, probably altered by Shakespeare himself. Most scholars today are in agreement with this theory. First recorded performance: according to the entry in the Stationers' Register in November 1607, the play was performed at Whitehall on 26 December 1606. Samuel Harsnett's A Declaration of egregious Popish Impostures (1603), one of Shakespeare's sources for Lear. Evidence: although the existence of two distinct texts complicates the issue of dating the play, what is known for certain is that it must have been completed (in some form) by December 1606. The play could not have been written any earlier than March 1603, as determined by Shakespeare's use of Samuel Harsnett's Declaration of Egregious Popish Impostures, from which he took some of Tom O'Bedlam's dialogue, which was entered into the Stationers' Register on 16 March 1603.However, the terminus post quem can possibly be pushed forward to 1605. Gary Taylor believes that Lear was influenced by George Chapman, Ben Jonson and John Marston's Eastward Ho, written in early 1605, and George Wilkins' The Miseries of Enforced Marriage, written no later than mid-1605. Furthermore, the line "these late eclipses in the sun and moon" (Sc.2.101) could refer to the lunar eclipse of 17 September and the solar eclipse of 2 October 1605. Of vital importance in dating the play, however, is the 1605 publication of an older version of the story, the anonymous play The true Chronicle History of King Leir and his three daughters, Gonorill, Ragan and Cordella. The publication of Leir in 1605 is often taken as evidence that Shakespeare's Learwas on stage by 1605. Leir was entered into the Stationers' Register on 14 May 1594, but had already been staged, and is usually dated to c.1590. There is no evidence it was ever published prior to 1605, and its sudden appearance in print over ten years after its composition could represent evidence of an attempt to capitalise on the success of Shakespeare's newly released play. On the other hand, in his 1997 edition of the play for the third series of the Arden Shakespeare, R.A. Foakes argues the 1605 publication of Leir inspired Shakespeare to write his own version of the story. There is little doubt that Shakespeare used Leir as a source, and Foakes' believes that some of the parallels are too specific to represent Shakespeare's remembrance of a performance, rather he must have been working with a printed copy. 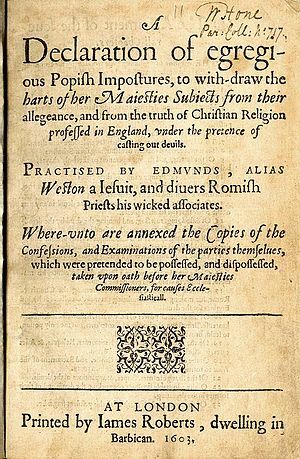 Foakes also argues that the title page of Q1 specifically recalls the title page of the 1605 Leir to "alert" readers to the fact that Shakespeare's version is based on the older version, but is much improved. For example, this explains the reference to Edgar and Gloucester on the title page. These characters are not in Leir, and their inclusion in the title of Q1 serves as an advertisement that Shakespeare's version of the story is more complex than Leir. If Foakes is correct, it means Shakespeare could not have started writing Lear until May 1605. In his 2000 edition of the play for the Oxford Shakespeare, however, Stanley Wells argues there are echoes of Leir in plays as chronologically wide-ranging as The Taming of the Shrew, Richard II, Much Ado About Nothing and Hamlet, suggesting Shakespeare was very familiar with the play from at least the early 1590s. The publication of Leir in 1605 could also be connected to the case of Brian Annesley, a wealthy Kentishman, who may, or may not, have influenced Shakespeare in writing Lear. In 1603, Annesley's eldest daughter, Grace, tried to have him declared a lunatic so she would be placed in charge of his estate. She seems to have been supported in this by her husband (Sir John Wildgose), her sister (Christian) and her brother-in-law (William Sandys). However, Annesley's youngest daughter, Cordell, wrote to Robert Cecil, Earl of Salisbury for help, and successfully blocked Grace's plan. Annesley died in July 1604, and most of his estate was left to Cordell. Whether or not Shakespeare knew about the case is unknown, but if he did, it provides more evidence for a date of composition in the period 1604–1606.Whatever the case regarding Leir and Annesley, however, Halio, Foakes, and Wells all date the initial composition of the play to 1605–1606. In regards to the revision of the text, stylistic analysis tends to view Q1 and F1 as two distinct texts, and in this sense, a rare word test, pause test and metrical test of Q1 all place it between Othello and Macbeth, and either immediately before or immediately after Timon of Athens. A rare word test of the passages unique to F1, however, place it closest to The Winter's Tale, Cymbeline, The Tempest and Henry VIII.